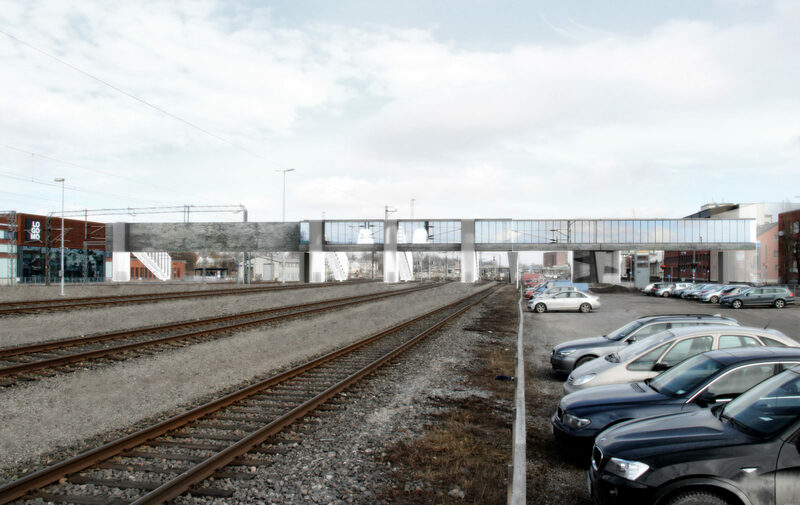 The new pedestrian bridge connects the Logomo concert and conference venue and the nearby residential areas with the city center accross the railyard. The bridge also provides an easy access from the train station to the tracks. The bipartite sculptural proposal tightly incorporates art, architecture and engineering. The in situ reinforced concrete structures set the parameters for the design: the openings are defined by the C-profile beams. The openings between the two parts are formed as bronze coated gates and the exterior walls have full height glazing. The views both from and within the covered bridge are thus unobstructed. Seen from the outside the people crossing the bridge become performers in a lively shadow play.